Now that the club is holding monthly fly tying sessions, many members who don’t have tools are wondering what to buy, and how much it’ll cost. Here’s an excerpt from the “Fly Lines” column of the July, 2012 issue of Louisiana Sportsman magazine, modified with updated prices. It’s often said tying your own flies saves money. In some cases, it does. But most tiers will agree with actor Ewan McGregor, of Star Wars fame and who portrayed biologist and fly fishing expert Dr. Alfred Jones in the movie “Salmon Fishing in the Yemen”. In an interview, McGregor explained the reasons why he himself loves to tie flies: that crafting a fly is transcendental, and there’s nothing more gratifying than catching a fish on a fly you tied. Here’s another reason to tie your own: Only a small percentage of all flies are sold commercially. For example, of the nearly 300 patterns found in Angelo Peluso’s new book, "Flies of the Southeast and Gulf Coast," less than a third can be found in shops or online. Getting started fly-tying is easy and needn’t cost much. All you need are a few tools and a few materials. The basic tools include a vise, scissors, thread bobbin, needle bodkin, hair stacker and hackle pliers. The vise is the most important tool of all. It secures the hook so materials can be binded to it. There are many different types, and a wide range of prices, of vices based on how they are made, how they hold the hook and how the hook is presented. For bass and redfish flies, you’ll need a vise that can tightly hold hooks to size 3/0 or larger. One way to test a vise is to put a hook in it, and tighten to the max. If you can still push the hook down with moderate pressure from your thumb, it’s not strong enough for large flies. The best bang for the buck here is the Griffin 1A vise ($45). It’s made in the USA and carries a manufacturer’s warranty. The tension knobs on each side of the jaws give it the power to hold hooks from the tiny size 24 to a whopping size 6/0. For big flies, the Regal ($175) is the bulldog of vises. It doesn’t require adjustments, as its spring-loaded jaws clamp tightly on a wide range of hooks. The head also pivots and rotates, making it the choice for many who tie with deer hair or other patterns that require examination of the fly from different angles. The Regal comes with a lifetime warranty. And like most vises, it comes in two support options. The C-clamp secures to a table or desk, and is the better choice for deer hair work. The pedestal base is convenient for travel. There’s an imported knockoff of the Regal called the Crown vise ($50). This can be a great buy, if you get a good unit, but quality control seems to be an issue. I suggest testing a unit out of the box before making your purchase. Another option is an inline rotary vise. This one turns the hook such that its shaft stays exactly in the same plane. Rotary vises are great for quickly making lots of wraps of material around the shank of the hook. If you tie lots of bendbacks, charlies and similar flies, an inline rotary like the Peak Vise or the Renzetti Traveler might be worth the extra dollars. For scissors, I recommend either the Orvis ($10) or Dr Slick ($15), which have serrated edges for better cuts. Another serrated model from Tiemco ($23) comes with plastic-covered handles for added comfort. For working with copper wire or other materials that can damage scissor blades, I keep a small pair of pliers handy. The bobbin not only holds the thread used to tie materials to the hook, but it acts as a pinpoint extension of the fingers to better work thread into tight spots. The rubber bushings hold the thread spool firmly so the thread maintains even tension. If you apply too much pressure on the thread while tying a fly, the spout of the bobbin (where the thread comes out) will cut the thread. For this reason, I strongly advise getting a ceramic bobbin ($8-$15). Hackle pliers hold the tips when wrapping feathers around hooks (called "palmering"). 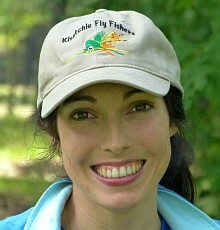 Although mostly used for trout patterns, there are numerous saltwater flies where palmering is required. One is the Whitlock Baitfish — a favorite for wintertime specks here in Louisiana. Standard hackle pliers run $2, rubber tipped-models run $4, and rotating models run about $8. A bodkin ($2 - $6) is just a needle on the end of a stick. It’s used to apply head cement to the thread and possibly parts of the fly. It also comes in handy for picking out dubbed bodies, like that on the Coma Shrimp, to give the fly a fuller look. The handles of some bodkins can also be used as a half-hitch knot tool. Highly recommend getting one of those. A hair stacker ($3 - $10) helps align the tips of deer hair or bucktail. It is a necessity for tying more-realistic-looking Clouser Minnows. After the basic tool set comes material selection: hooks, feathers, fur, eyes, synthetics. This is where instruction plays in. These days, there’s no shortage of instructional books, DVDs, Web sites and YouTube videos covering tying techniques and fly patterns. Decide what you’ll be fishing for, find a few flies that work for those species, and concentrate on the materials and instructions for those few. This is where human interaction is priceless. Each month, most of the state’s fly fishing clubs and fly retailers offer free tying clinics open to the public. Often materials are provided; you only need to bring tools. From other tiers, you’ll learn what flies work best and what color combinations to use. Dates and locations for these sessions can be found on the Calendar page of www.laflyfish.com.